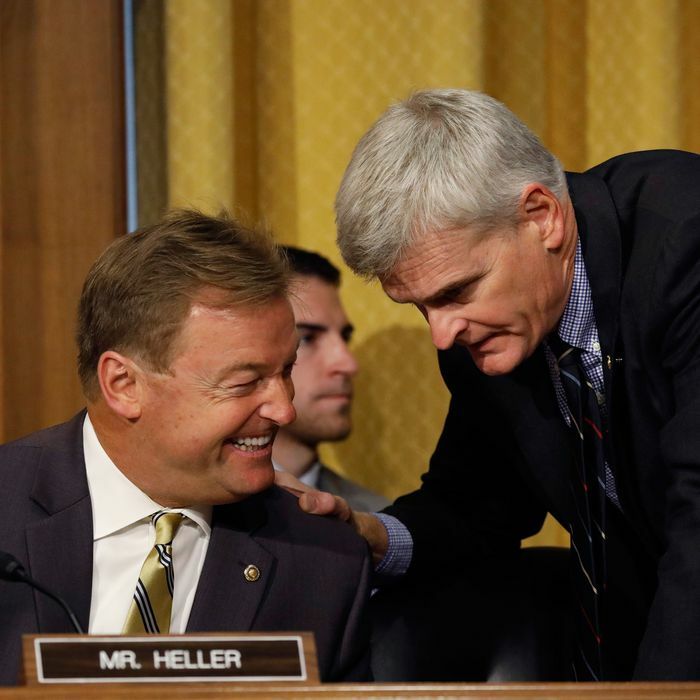 Senator Bill Cassidy and his co-sponsor Dean Heller confer before trying to rush their devastating health-care bill through the Senate. In the mythology of the Senate as the “world’s greatest deliberative body,” the upper chamber’s tradition of weighty, even ponderous, hearings plays a central role. The Senate holds hearings to investigate, confirm, impeach, and most of all to slow down the pace of legislation with the back-and-forth of questions and answers, witnesses and pontificators. That’s why the gambit being pulled by Senate Republicans in holding entirely phony hearings on the Graham-Cassidy legislation that they’re trying to race to and floor is so egregiously offensive. First, the Homeland Security and Governmental Affairs Committee (chaired, not coincidentally, by early Graham-Cassidy co-sponsor Ron Johnson) announced it would hold a one-day hearing on September 26 (the week the bill is expected to hit the Senate floor) on the subject of: “Block Grants: How States Can Reduce Health Care Costs.” That sounds mighty objective, doesn’t it? It’s also worth noting that Johnson’s committee has zero jurisdiction over health-care legislation. He even admitted he was only doing this because the committees that did have jurisdiction weren’t stepping up. Everybody, but everybody, knows these hearings are about one thing and one thing only: providing John McCain, who is three-fourths of the way to giving his “amigo” Lindsey Graham his extremely critical vote for the bill, a fig leaf to cover his intended retreat from complaints that the Senate has abandoned “regular order” in considering this and indeed every other bill to repeal and replace Obamacare. A big part of “regular order” is hearings, so presto: the GOP is ordering one up. That these hearings will be about as deliberative as a Trump tweet is obvious enough. But they will check a box. And holding fake hearings is in its own way an appropriate climax to the entire GOP health-care-policy charade that has been running all year, characterized as it has been by secrecy, misdirection, pure partisanship, and the systematic violation of Senate precedents. The only thing that would make the contempt of the congressional GOP for transparency any clearer would be to use the hearings to announce the rushed, absolutely minimal CBO “score” of Graham-Cassidy that won’t tell us the bill’s impact on the budget, health coverage, or insurance premiums. In 18th-century Russia a consort of Catherine the Great named Grigory Potemkin reportedly built flimsy, portable “villages” on the banks of the Dnieper River to impress Catherine and some foreign ambassadors passing by on a barge. These “Potemkin villages” became the eternal symbol of contrived, bogus industriousness. Leave it to Mitch McConnell and his colleagues to hold Potemkin hearings in hopes that John McCain will fool himself into believing the Senate is deliberating on Graham-Cassidy. It’s all theater.